CARNDONAGH Foróige Club has become the first in the country to receive Fairtrade status. 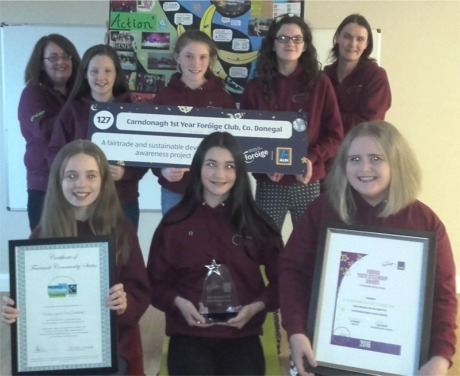 Volunteer leader with the Carndonagh club, Laura Duncan, said the group decided to do a Fairtrade and Sustainable Development Goals project as part of the Aldi Youth Citizenship Challenge. The club went on to win a Silver Star award at the Aldi awards in Dublin. “The club began the project in November creating a sustainable development video. In February Fairtrade Fortnight took place and we attended the Fairtrade Big Breakfast in Carndonagh. At the event we met with a Fairtrade banana grower from the Dominican Republic," said Laura. The local group also held a Fairtrade coffee morning and bake sale in March and encouraged local businesses to get involved the world Fairtrade Coffee Challenge, encouraging businesses and organisations around Carn to get involved. Fair play: Pictured with their coveted Fairtrade awards are members of Carndonagh Foróige Club. Front row from left: Aoife Smyth (committee member); Amanda Duncan (treasurer) and Elishia Moyne (chairperson). Back from left Marie Moyne (club leader); Rhianna Gallagher, Eimear Doherty, Blaithin Gillen and Laura Duncan (leader). Fairtrade is a partnership between some of the world's most disadvantaged farmers and the companies that buy their products. The local Foróige group is actively involved in the Carndonagh Fairtrade town committee and uses Fairtrade products. It applied to Fairtrade Ireland for Fairtrade status and in June, the certificate was granted. The certificate is valid for two years and during this time, the club "will continue to promote Fairtrade". “Fairtrade status means recognition of Foróige Carndonagh's commitment to social and economic justice. We are delighted with our achievement,” added Laura.